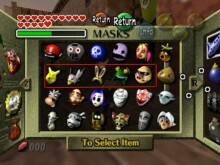 If you’ve ever played Starfox 64 and Majora’s Mask before, you might have noticed something familiar about the particular order of the five animal masks lined in a row on the masks screen. By no coincidence, Shigeru Miyamoto, creator of both the Starfox and Legend of Zelda series found the opportunity include several Starfox 64 characters as cameos in the form of masks. As stated in the video: the Keaton Mask resembles Fox McCloud, the Bremen Mask as Falco Lombardi, the Bunny Hood as Peppy Hare, Don Gero’s Mask as Slippy Toad, and the Mask of Scents as Pigma Dengar. Were you able to make the connection on your own? Tell us in comments below.